take a gander at this glorious patchwork DIY sweater-cape made by finland's outi of outsapop trashion, above! 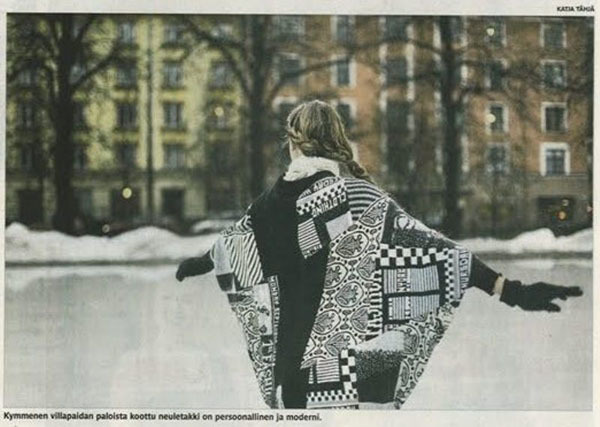 the sweater-cape and instructions on how to make one for yourself were recently published in the helsingin sanomat. she graciously re-printed the instructions on her blog, in this post, along with an english translation. how AWESOME. thank you, outi!! the project looks complicated, yes, but really, all it takes is some time and a little effort, and whoa, are the results stunning, or what? ?